Purple top white globe turnip seed - purple top turnips are generally tolerant of freezing weather, and their roots can be stored for a fairly long period of time in cold storage conditions. Rutabagas or Swedish turnips ("swedes ") tend to be somewhat larger, sweeter and less strongly flavored than turnips. Also, their flesh is a yellowish creamy color. 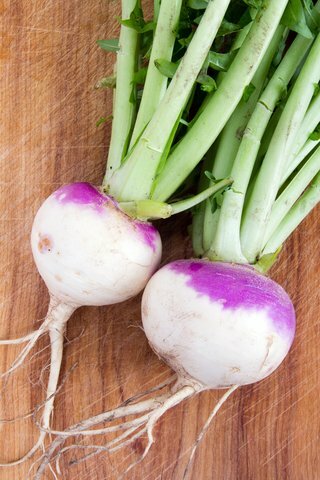 Turnips have a crisp white flesh and a zesty mustard-like flavor. Seed Rate: 5-10 lbs. per acre. 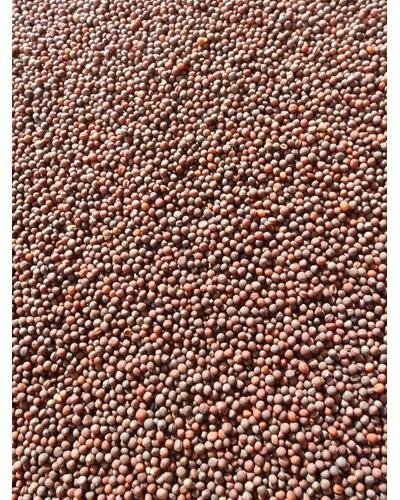 Seed Depth: 1/8 - 1/4 inch. Fertilizer: 8-8-8 250 lbs. per acre. 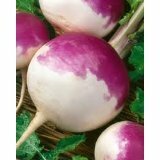 WHITE GLOBE PURPLE TOP TURNIP 5 LB. White Globe Purple Tops are a brassica family plant that deer and livestock love to eat. 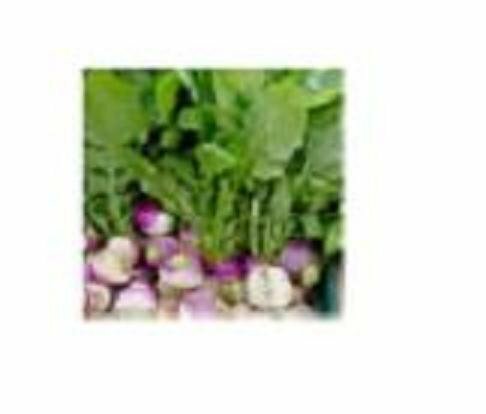 Turnips are tolerant of moderate frost as seedlings in spring, and as mature plants in fall. 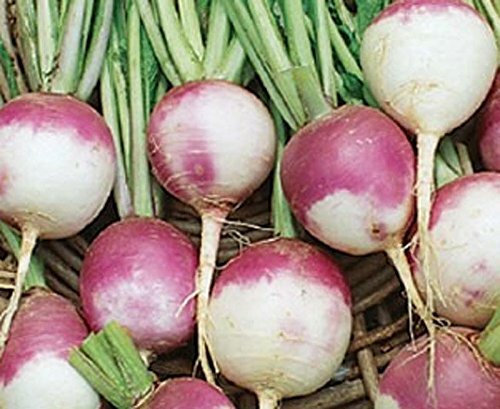 White Globe Purple Top Turnip is an excellent soil conditioner as well as a forage product. Turnip produces high-quality forage if grazed before heading. Deer and Livestock eat the stems, leaves and roots of turnip plants. Above-ground parts normally contain 20 to 25% crude protein, 65 to 80% in vitro digestible dry matter (IVDDM), about 20% neutral detergent fiber (NDF) and about 23% acid detergent fiber (ADF). The roots contain 10 to 14% crude protein and 80 to 85% IVDDM. Brassicas, such as turnips, are both cold-hardy and drought-tolerant. They can be planted late-even as a second crop-and provide high-quality grazing late in the fall. Turnip planted in July will provide grazing from September to November. The most vigorous root growth takes place during periods of low temperature (40 to 60 F). 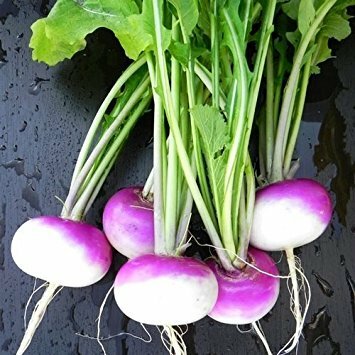 Purple Top White Globe Turnip Seed - Purple Top Turnips are generally tolerant of freezing weather, and their roots can be stored for a fairly long period of time in cold storage conditions. 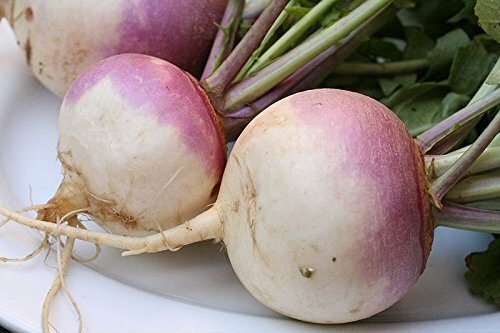 Rutabagas or Swedish turnips ("Swedes ") tend to be somewhat larger, sweeter and less strongly flavored than turnips. Also, their flesh is a yellowish creamy color. Turnips have a crisp white flesh and a zesty mustard-like flavor. Purple Top Turnips are generally tolerant of freezing weather, and their roots can be stored for a fairly long period of time in cold storage conditions. Rutabagas or Swedish turnips ("Swedes ") tend to be somewhat larger, sweeter and less strongly flavored than turnips. Also, their flesh is a yellowish creamy color. Turnips have a crisp white flesh and a zesty mustard-like flavor. Purple top turnip seed. Early maturing and easy to grow. Good cover crop. Great addition to your garden. Heirloom seed, non GMO. Early Maturing. Grown in USA by an American farmer. OrOlam Turnip Microgreens Seeds A Fast easy grower that prefers lower light levels Prefers indirect light. Substantial greens that have a flavor like a sharp kale or spinach. Grow Micro Turnip. Notes and Growing Tips: Turnip microgreens are fast and easy to grow. Flip the lid on day 3 or 4 to strenghen the crop before you expose to light. 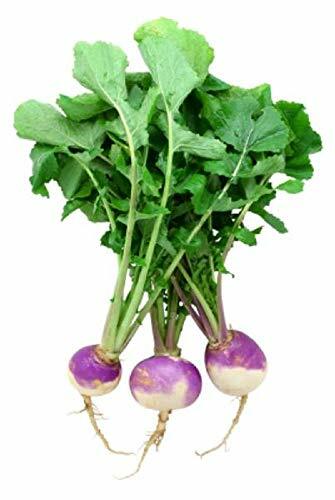 Turnip is a nice green color and has a mildly peppery mustard flavor. OrOlam King Shot Food Plot Fast growing seeds Serious whitetail hunters are looking for ways to increase their chances of scoring on that trophy. OrOlam King Shot Food Plot Turnip Brassica Seeds Fast growing, offering a food plot the deer will crave during the spring, summer, fall and winter. If you can only plant one food plot, you most plant OrOlam KingShot!! Compare prices on Purple Top Turnips at Shopsimal.com – use promo codes and coupons for best offers and deals. We work hard to get you amazing deals and collect all avail hot offers online and represent it in one place for the customers. Now our visitors can leverage benefits of big brands and heavy discounts available for that day and for famous brands.